For many years IOCD operated the BEF, which worked to encourage and facilitate the sustainable and equitable exploitation of natural resources for local benefit in low- and middle-income countries (LMICs) and for global benefit. Below we present some highlights from the work of this important IOCD initiative and salute the scientists who contributed to its success: in particular the leadership of John Kilama, supported by Michael Tempesta. Exploitation of the Earth's physical and biological resources has always been a feature of human activities, but the pace and extent of this exploitation have increased greatly in the last two centuries driven by and feeding technology advances, economic growth and population expansion. Many LMICs which have been mainly the source of raw materials such as minerals and primary agriculture products now wish to reap the economic and developmental benefits of increasing production and adding value to the materials through processing. At the same time, global concern for the environment requires that all countries conserve their natural resources, engage in sustainable development and not follow pathways that may lead to pollution, exhaustion of resources and loss of biodiversity. Some examples of key contributions of chemistry to these challenges include developing cleaner, more efficient, less energy-intensive and less polluting extraction and refining methods for minerals; methods for the recycling of inorganic and organic materials; and new substitute materials that can be produced more sustainably. Overall, about a third of all currently used medicines are derived from compounds first extracted from natural sources such as plants, bacteria and fungi. These include antibiotics, anti-cancer agents, analgesics, tranquilizers, muscle relaxants and substances in many other therapeutic classes. An example of a product found through ‘chemical prospecting’ is ivermectin, a fungal metabolite of highly complex structure which has been marketed for treatment of parasitic worm infections in animals and human beings. As well as generating US$ 1 billion in sales, its donation by Merck to the World Health Organization laid the basis for the treatment and prospective eradication of river blindness (onchocerciasis) in Africa. Products from Aloe plants have been very successfully commercialized to take advantage of their medicinal properties. When a country links local scientific activity with local commercialization of the resulting products — pharmaceuticals, agrochemicals, or personal care products — the country may gain revenue to benefit its people and the success of the process can serve as an incentive for putting conservation measures in place. One example of the power of bioprospecting is Madecassol®, a drug used for more than 25 years to treat intense burns, leprous wounds, and inflamed ulcers. It was developed from chemicals produced by the plant Centella asiatica in an effort involving scientists at the Malagasy Institute of Applied Research in Madagascar. The institute has earned valuable royalties from the drug's sales. Another example is Nicosan, which was developed at the Nigerian National Institute for Pharmaceutical Research and Development. This plant extract has shown success as a treatment for sickle-cell anemia, where it may help to reduce episodes of sickle cell disease crisis associated with severe pain. The drug has been approved for sale in Nigeria, and its manufacturer is currently seeking approval in the US and EU. The exploitation of biological resources has become an area of particular concern. Conservation of biodiversity is considered vital for long-term human survival because plants, animals and bacteria can be the source of new nutrients, genes conferring resistance to crop pests, drugs for combating diseases and much else. This implies that studies are undertaken globally to uncover these valuable assets, but exploitation needs to conserve their stocks as well as ensuring appropriate rewards for their owners. Countries which have some of the most valuable and diverse and least studied biological resources — often LMICs — have sometimes experienced ‘biopiracy’ in which samples of plants or knowledge about their uses have been taken abroad and exploited without benefit to the country of origin or to the local inhabitants whose indigenous knowledge has been the key. Valuable lessons have been learned from the experience of LMICs that have developed ways to meet these challenges. One ground- breaking example has been that of Costa Rica, a Central American country which covers 0.04% of the world's total land area, yet is believed to harbour about 4-5% of the estimated terrestrial biodiversity of the Earth. In 1989, Costa Rica founded the Instituto Nacional de Biodiversdad (INBio) to gather knowledge on the country's biological diversity, its conservation and its sustainable use. In 1991, INBio instituted an innovative agreement with a multinational pharmaceutical company, in which Merck was granted the right to evaluate the commercial prospects of up to 10,000 plant, insect, and microbial samples collected in Costa Rica. In return for these ‘bioprospecting’ rights, Merck paid INBio US $1 million over two years, and provided equipment for processing samples and scientific training. Merck also agreed to pay a royalty — to be shared equally by INBio and the Costa Rican Ministry of Environment and Energy — on the profits of any future pharmaceutical product or agricultural compound that isolated or developed from an INBio sample. Subsequently, INBio negotiated several further bioprospecting contracts involving other partners than Merck, including Eli Lilly, with the result that income from INBio's bioprospecting activities rose to about US$1 million per year. The Costa Rica example demonstrates the possibility of conducting research to identify new medicinal products from natural sources in an LMIC, in a way that preserves property rights, generates a financial return and encourages capacity building. Many of the lessons were taken forward in the International Cooperative Biodiversity Groups Program, initiated in 1992 to make multi-disciplinary, multi-institutional awards to foster work on the three interdependent issues of drug discovery, biodiversity conservation, and sustainable economic growth. The BEF has assisted several LMICs in Africa, Asia and Latin America to develop policies for ethical, sustainable bioprospecting, helping establish the foundations for new products and processes that will contribute to better health and economic development. Bioprospecting links laboratory work on biodiversity by a country's scientists with local enterprises, which bring to market products based on the scientists' findings. At the same time, bioprospecting involves a commitment to conserving a region's biodiversity to ensure its survival and usefulness for future generations. Nepal: In 1997, the Royal Nepal Academy of Science and Technology requested IOCD to assist them in building local capacity for bioprospecting in Nepal. Assisted by a grant from the Novartis Foundation for Sustainable Development, an IOCD scientist travelled to Nepal to join members of the Nepal Traditional Medicine Promotion Group (TMPG) in a joint mission of several weeks. An initial workshop with the Traditional Medicine Promotion Group explained the process of drug discovery and outlined the operations and policies for bioprospecting. Discussions were held about follow-on and IOCD provided a small grant to the TMPG for implementation of local action, with a view that TMPG could serve as a basic component of a long-term programme for developing the capacity and infrastructure in Nepal for bioprospecting. South Africa: In 1996 South Africa's Council for Scientific and Industrial Research (CSIR) and IOCD scientists cooperated in organizing a bioprospecting workshop with university researchers, traditional healers, and other organizations. Today, CSIR is pursuing a robust bioprospecting programme in full compliance with the UN Convention on Biodiversity. Kenya: In 1998 IOCD cooperated with the International Centre of Insect Physiology and Ecology (ICIPE) in Nairobi, Kenya, to establish a bioprospecting programme that continues to expand and prosper. Follow-up since then with the Government of Kenya has led to the establishment in 2011 of a national bioprospecting strategy supported by Sh10 billion funding. The strategy is spearheaded by the Ministry of Forestry and Wildlife and Kenya Wildlife Service and will provide structures and systems to effectively and efficiently manage and regulate bio-prospecting activities in Kenya. It will seek to tap the huge market of bioprospecting and generate wealth and knowledge for the country. An estimated 80 per cent of Kenya's population depends on biodiversity. The strategy will be implemented through enhancing institutional capacity and review of the statutory and regulatory framework for bioprospecting and also developing a system of bioinformatics and benefit sharing. Other elements include enhancing information access and developing a communication system as well as a financial and resource mobilisation mechanism for bioprospecting. The launch makes Kenya among the first countries in the world to have a bioprospecting roadmap after establishment of the Nagoya Protocol on access and benefit sharing. Kenya's Minister of State for Planning, National Development and Vision 2030, Hon. Wycliffe Oparanya said that implementation of the strategy will contribute to the achievement of the Vision 2030 development blueprint, through improved management of biodiversity that enhances the economic wellbeing of the Kenyan people. 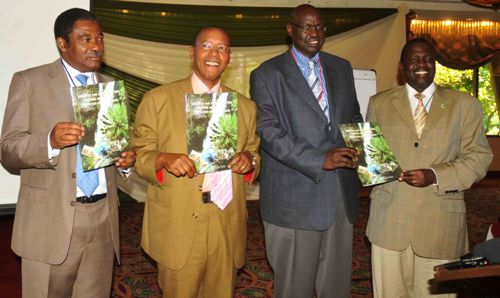 He stressed the need for the country to have a common vision on biodiversity management. “Management of Kenya's biodiversity is vested in various agencies which lead to overlaps and competition on limited resources. All these need to be realigned with the new constitution to avoid duplication and overlaps while also taking into consideration the emerging issues of global concern,” he added. The launch also saw an expert dialogue workshop for effective biodiversity laws that attract investments for economic growth. Left to right: Mr. M.A. Wa Mwachai, Permanent Secretary, Ministry of Forestry and Wildlife; Hon. Mutula Kilonzo, Minister for Justice, National Cohesion and Constitutional Affairs; Dr. John Kilama, IOCD; Mr. Julius Kipng'etich. Uganda: In 1998, noting the successful early progress of the Kenyan initiative, a group of scientists in Uganda contacted IOCD with a request for assistance to establish bioprospecting in their country. IOCD began a long-term programme to facilitate this. In April 2005, with IOCD cooperation, the Uganda National Council for Science and Technology convened the National Conference on Bioprospecting, entitled “Bioprospecting for Economic Development.” Recommendations of this conference called for establishment of the National Centre for Bioprospecting in Uganda. To facilitate passage of essential legislation on biodiversity by the Uganda parliament, in March 2007 at the request of the Uganda Minister of Planning IOCD convened a consultative briefing with members of Parliament, university vice chancellors, entrepreneurs and representatives of indigenous peoples. In a further follow-up, IOCD has been assisting Ugandan policy makers in the development of draft legislation on bioprospecting for parliamentary approval. Managing intellectual property (IP): The capacity to identify, negotiate and manage IP is crucial to a country's interests if it is to protect its natural resource, safeguard their use in ethical and sustainable ways and ensure a return on their value. IOCD has responded to recent requests from scientists and policy makers in East Africa with assistance in organizing training in IP. A planning meeting for IP training was held at the Kenya Wildlife Service headquarters in 2014 and further work on the training project is under way. In promoting bioprospecting, IOCD strives to comply with the UN Convention on Biological Diversity. Charles Weiss and Thomas Eisner, both of whom helped to launch IOCD's BEF, discuss some of the challenges and useful strategies of bioprospecting in their article "Partnerships for value-added through bioprospecting," Technology in Society, 20, 481-498 (1998). For reprints, please contact IOCD. Kim Lewis and Fred Ausubel have published a detailed analysis of strategies for bioprospecting specifically aimed at developing antibacterials: K Lewis & FM Ausubel, 'Prospects for plant-derived antibacterials', Nat Biotech 24(12), 1504-7, December 2006. The paper is available here. Jacques Gaillard and colleagues describe the work of the Malagasy Institute of Applied Research on page 170 of the UNESCO Science Report 2005. IOCD's John Kilama has co-authored a review of the value of natural biological resources as a source of new medicines, in an important work co-sponsored by the UN Development Programme, UN Environment Programme, Secretariat of the Convention on Biodiversity and World Conservation Union: D.J. Newman, J. Kilama, A. Bernstein, E Chivian, Medicines from Nature, in E. Chivian, A. Bernstein (Eds), Sustaining Life: How Human Health Depends on Biodiversity, Oxford University Press, 2008, Chapter 4, 117-161. Eisner, T. Chemical prospecting: A global imperative. Proc. Amer. Philos. Soc, 1994, 138, 385-395. National Biodiversity Institute (INBio) of Costa Rica. Weiss, C.; T. Eisner. Partnerships for value-added through bioprospecting. Technology in Society, 1998, 20, 481-498.